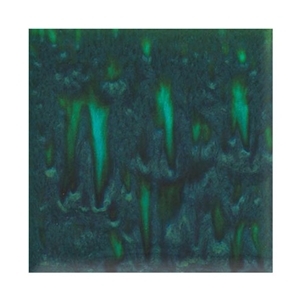 Mayco's Jungle Gems Crystal Glaze - Peacock Green - transforms in the kiln when small pieces of glass crystals and specks burst into color and intricate patterns during the firing process. Use alone for stunning effects, in glaze combination blending with Stroke & Coats®, or simply as an accent to your design. Fired finish will be textured. Not recommended for dinnerware due to surface characteristics. Follow the instructions provided on the bottle. Mid-range color results are provided on the label. MAY BE HARMFUL IF SWALLOWED. Contains copper. Avoid ingestion, wash hands immediately after use. KEEP OUT OF REACH OF CHILDREN. If swallowed, get prompt medical attention. Ceramic pot by BF Barrie using Sculpture House Artware Pottery Clay, bisque fired at Cone 05, glaze fired at Cone 05.